Police investigating a £500,000 raid in Bristol have arrested three people in their 30s. Three masked raiders dropped thousands of pounds on the road as they stole bundles of notes from the cash depot on Monday, 13 November. The money was stolen from the Group 4 site in South Liberty Lane, Bedminster. As they drove away in a Land Rover, the robbers scattered notes, which were later recovered by police. The getaway vehicle was later found burnt out. 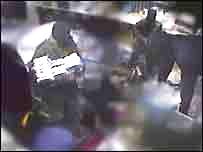 A £50,000 reward is being offered for information on the robbery which leads to a conviction.